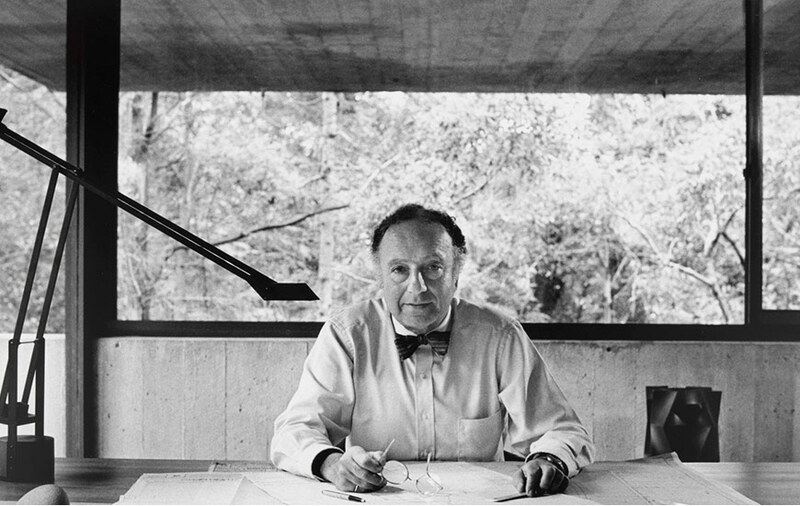 Harry Seidler is Australia’s best-known and foremost modernist architect. His work between 1948 and 2009 in Australia defines our country and reflects his interest in the timeless architectural style and big ideas of the Bauhaus movement. Grosvenor Place, a project which began in 1982 and completed in 1987, is just one example of this. His two great influences were Marcel Breuer and Pier Luigi Nervi. Tellingly, Breuer was part of the first generation of Bauhaus students, and Nervi was an engineer and constructor in concrete, famous for the artistic qualities of his buildings. Harry Seidler was ahead of his time. His use of concrete, the absence of columns in his interiors and his passion for incorporating art into architecture are just some of the most recognisable qualities in his work. Peerless in Australia, Seidler’s contemporaries included I.M. Pei, Ulrich, Franzen, Henry Cobb, Son Olsen, John Parkin, Paul Rudolph and Edward Barnes. The architect studied with these fellow visionaries at Harvard. Seidler’s most notable commercial works in Australia include Australia Square (1967), the MLC Centre (1975) and Grosvenor Place (1987). 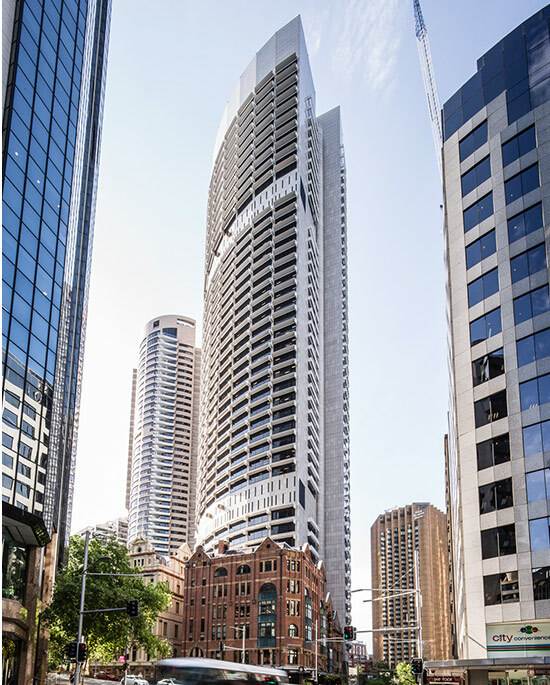 Seidler once described Grosvenor Place as, “… a camera on the view” of Sydney Harbour. Seidler was briefed to create a single 44-storey tower with an unusually large floor plate and responded by designing not only an architectural masterpiece with two convex ‘camera lenses’ focused on breathtaking views of Sydney Harbour, but a flexible working destination. The flexible, column-free workspaces are amongst Sydney’s largest and the building houses up to 5,000 people. With an eye on sustainability, Seidler sourced Sardinian granite for the facing of the building. The grey and pink polished stone was chosen to determine the external look of the building and for its ease of maintenance, reducing the energy needed to operate the building. Solar heat gain is deflected from the floor to ceiling windows by hollow aluminium sunshades tilted at different angles in relation to the sun and work to reduce load on air conditioning. Seidler’s love of pillars is represented by the repetitive prestressed t-shaped floor planks resting on I-shaped spandrel beams that lift the office spaces above the three-storey lobby. This design first appeared in the Trade Group Offices (1974) in Canberra and the MLC tower (1975). Civic spaces designed to provide an element of social use in his buildings was also important to the architect and a rarity for commercial buildings of this time. 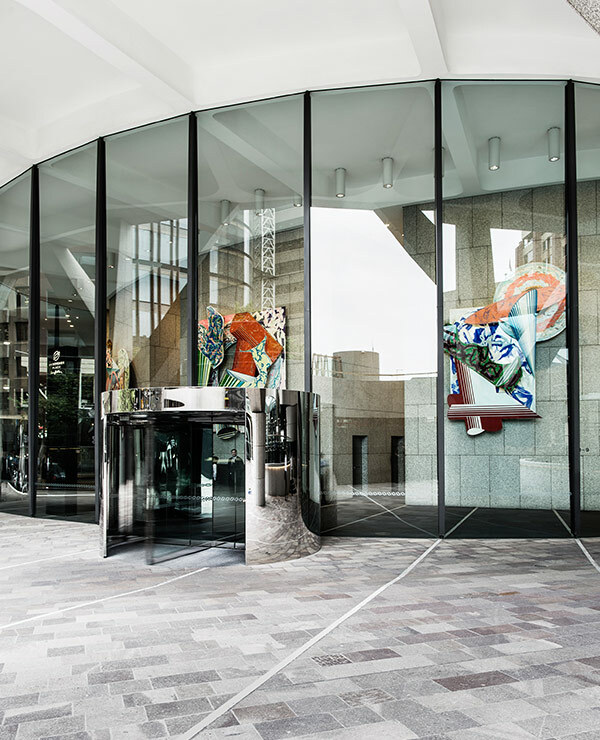 The spectacular views, elliptical footprint, open spaces, pillars, streams of natural light and rich granite and golden onyx lobby all help to define Grosvenor Place as a feat of modernist architecture and a great work of art. Seidler truly believed in the importance of art and was a frequent and passionate collaborator with visual artists in the design of his buildings. His collaborators include artists of note such as Alexander Calder, Le Corbusier and Sol LeWitt to name a few.